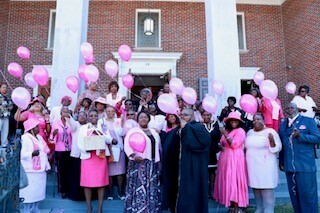 Click here for the Worship in Pink Toolkit! Remember to check back often for the latest news and downloads. You can use the toolkit to download and print educational materials. There’s no charge and no need to place an order. You can download educational materials year-round, whether it’s for a Worship in Pink program or your own breast cancer education event. If you ordered fans, click here for Fan Distribution Details. Registration for free fans has closed but you can still participate using the Worship in Pink Toolkit. In honor of all the women in our lives, and especially our mothers, Komen South Carolina celebrates Worship in Pink in May by providing complimentary materials to registered organizations. We encourage everyone to continue the celebration throughout October by downloading materials and designing your own event! This allows for a year-round reminder of the importance of taking care of our lives. Worship in Pink is a breast health education initiative for the Affiliate’s faith-based communities in an effort to reduce disparities. Each May Komen SC donates materials to registered organizations for use in their local programs and events. Organizations can also participate during October by using the Worship in Pink toolkit to develop their own breast health events. The program has provided more than 100,000 women and men with breast health education and resources. By empowering women and men to take charge of their health, we continue to work toward our bold goal to reduce the current number of breast cancer deaths by 50% in the US by 2026. Looking for gifts and goodies for your event? Visit ShopKomen for Komen branded merchandise. When you use this link, a portion of the proceeds supports Komen South Carolina!